I know this has been brought up a lot, but my question is a little bit different. Here's my problem. I did the jar back in 2009.....and it's still in my closet. And now i'm moving. I was told to perform the spell and have faith (which i did) and wait for results. But was never told to dispose of the jar right away after the results happened. And over the years/ hectic life changes and everything, i honestly forgot about the jar because things were going well with me and my boyfriend. I don't live near any crossroads or lakes/rivers and the like. And everything is covered in a lot of snow so i can't toss it in a body of water or bury it. I wish i knew to dispose of it sooner and now i feel like by keeping the jar for so long, it's a bad thing. Or is it ok to dispose of the jar and just have faith and everything will be fine??? Someone please help ease my mind? What was the spell for exactly? It was to bring my ex boyfriend back. I had it going with a honey jar done by a rootworker, reconciliation candle lit by LM, and had a different rootworker helping me with figure candle work from home. Since you've had it for 5 years, you might as well hold on to it until the snow melts and you can dispose of it properly. Although I do find it surprising that no are no crossroads anywhere???? I know i messed up but i'm trying to correct my mistake. I read the disposal page (thank you for linking it), but can i bury the whole jar? Or should i open it and empty the contents out then bury the jar? @shakes head@ i didn't go about this the right way did i? never again, i'll get the proper instructions for my honey jar. If you're going to bury it: No. I would not open that jar. I can't find the ammonia jar i buried. I wanted to end the spell since the situation is no longer needed and i was told to burn the contents and recycle the jar. But i just can not find the jar. It was a recollection/return to me ammonia jar if that makes sense that was done a long time ago. What would happen if i can't find it? I know the area which it was buried but with all the rain and snow, my marker go moved. I want to end the relationship peacefully but i do not want the jar buried anymore so theres no obstacles when i work the separation spells. I just feel like its going to clash and i want everything to go as smoothly as possible. Please someone send advice? Thanks so much! You now want to separate from the person that you wanted back? If you can't find the jar, then let it go. You'll have to perform other spells. But we can't help you without knowing the details. Thank you, Cat for creating this community. A great resource and I enjoy reading the forums so much. I have had some success with freezer spells so I decided to try the ammonia jar. I did the jar on 4/27 and it brought the results I was hoping for today. I followed exactly as OP suggested. The same day I did the jar I saw obvious monetary signs(literally). Everywhere I went some advertisement with the amount of money that I needed would pop up. Now that it is completed, and work is done-I know I need to dispose of it. I am just unclear about running water. If I can't get to a stream or river..would it be alright to pour into sink with faucet running? Or is that insulting the work? I am newer than new to this so pls forgive me, I read the link about disposal, but still not sure. If the sink drainage goes to the sewer then I wouldn't recommend it unless you dilute it a great deal with water. I was told by a worker I have known for years that It would be okay to pour into toilet as long as it did what it was meant to do.I have not disposed of it yet but will do so tomorrow. Funny I just got approved for a credit card and my credit score is not that great. The best part is the credit limit is exactly the amount of money I needed initially! Anyway, thanks again. 1. His ammonia jar spell com you pour the whole bottle of ammonia in the jar or do you put drops water with drops of ammonia? I read pour the ammonia in but it's a small bottle of ammonia and it's pretty powerful so I need to make sure. 2. If I take a pull out candle, carve the names in it and add drops of ammonia to strip away an old spell, then add my oils, is that a good idea or is that pointless? I am having a little trouble understanding what your question is about. Can you describe the ammonia spell you are talking about a little more? That will give me a better idea of how to ask your question! The 1st is about a jar spell. You write the situation as is tape it on the inside of the glass then from what I read or am assuming you pour the bottle of ammonia in the jar and turn it yo side down. I wanted to know do we pour the whole bottle of ammonia in the jar or an we fill the bottle with water and then add drops of ammonia since half the bottle is supposed to be filled. 2. I wanted to break up a non romantical relationship with a simple candle spell, so I was wondering if I carved the names into the candle, then cleansed it with ammonia to strip away any blockages if that would be effective. 1) I think you answered your own question!!! As you can see, the jar is only HALWAY full of ammonia. Not full and not just "drops." I washed the candle with Florida water. 2. Carved their names in it. 4. added break up, I. confusion, destruction to the candle then I rolled it in cayenne pepper and red pepper flakes. 5.Then I light it- forgot to tap it so I just did that. I hope I didn't mess my work up though. Push comes to shove I will light another one on Saturday without the ammonia all else fails goofer dust on the 3rd candle and a vinegar jar will suffice. Now this makes sense! I couldn't make out what you were saying (and asking) earlier! LOL ! I don't understand what I should write for the ammonia spell. I am slow and new so I am willing to try. I want to clarify that should only write the wrongs being done to me only. Should I also include my desired outcome on the same piece of paper that will be soaking and shaken in the same ammonia liquid for a period of time. The best time to start will be a Saturday when the moon is waning. Your question is a little vague so it is kind of hard to answer. I merged your post into the thread that talks about using ammonia in hoodoo. Read over this thread and see if it answers your questions. After that let us know if you have any other questions! The paper that will be placed in the Jar: Should I only write the bad experiences I have only? Should I also write what I want the outcome to be? I see others have a similar question. Is it possible to create directions for the spell similar to the one in the purchased spell kits? Does day of the week or moon phase make a difference? You would just rite the bad situations (so that they go away). NOT the desired outcome. I like doing these type of spells during a waning moon. Thanks very much Miss. Aida. This is the directions I was looking for. 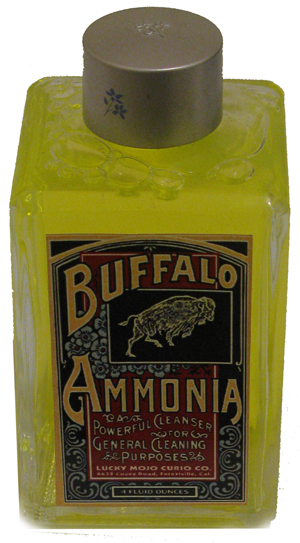 The ammonia would help with your obstacles. Hi everyone, I'm kinda new to the Lucky Mojo site and hoodoo at large. I have been reading around the site and learned a lot of information. My question is what to do with the bottle when the spell is complete? I would like to reuse it if I can, and if it's plastic I do not want to bury it in the ground as I feel it's polluting. If anyone can help me that would be great. PS the spell I am trying to cast is the ammonia jar spell. First, i do not recommend using plastic for bottle spells. As you note, it is toxic and polluting. Glass is traditional and there is no need to seek out plastic bottles to do something that glass bottles have done so well for so long. Second, as you will notice by now -- if you find your post! -- your question has been threaded into the topic on "Ammonia Jar Spells Questions and Answers." We try to keep the Forum threaded by topic, so newbies can find other questions and answers on popular subjects. So here we are. ... and, if you still have questions, JUST ASK. Thank you catherineyronwode. I quickly Read through the link you gave me and the thread and I have a firm idea what to do. Three questions still linger though. 1. When I dispose of the ammonia, does the water need to be fast running water or can any old river (or can i pour it in a lake)? 2. Do I pour out my petition along with the ammonia, or do I throw that away? 3. What to do about the tape? Because tape isn't biodegradable do I throw that out or do I have to dispose of it in the same manner as my petition and ammonia? 1. It is not the speed of the running water -- it is that is is running (moving onward) so a lake would not do, but the ocean would, if the tide were going out. 2. I would pour any paper remnants out. Remember, the paper will dissolve a bit. 3. I tend to treat plastic as garbage (not to pollute with it) and to treat glass as a recyclable. I advocate not littering. Just a reminder, because this spell keeps accruing questions! What about: "Remove all Obstacles from my goals"
Do you want him gone from that job? Then write something like: " (name of boss) will be fired from ____ "
I want to do a ammonia bottle spell to lose wright. But I'm confused as of how to word it! I want to lose 60 pounds and change eating habits to more healthier choices. What should I say? I don't want to say the wrong thing and end up gaining weight! I tried it before and I said " I am over weight" I thought that would reverse but it seemed like I ended up gaining weight! Say, "I am 60 lbs lighter and free of extra fat and weight." As Miss Aida showed you in the example above with the boss. Thanks for the reply. So I should speak about the result I want then turn upside down, or speak about the current situation as it is, like " I am 60 pds over weight? Then when I turn jar upside down, it will reverse situation? What j82 is saying is that once you state your intentions, it goes out into the universe to help reverse the gaining of weight. I'm sorry for being so confused on this. I read somewhere I'm supposed to write the situation as is. So I would write " I am 60 ponds over weight" and when I put it in jar and turn upside down and the issue would reverseand I wouldn't be 60 pds over weight! I did another jar, so please tell me if I did it wrong. A person I know hasn't been treating me nice. So I wrote (persons name) " is taking me for granted, she dosent respect my opinions or listen when I speak" I wrote it correctly on paper at the lid of jar facing inward and then I turned it over! Please tell me if that's what I should have down because writing situation out as is and making commands is too different things! You write the situation as it currently stands. In other words, spell out the problem you are trying to fix. Putting it in an ammonia jar and turning the jar upside down is intended to turn that situation around. It's only in other kinds of spells where you would petition your desired outcome. 1) Can I put both ammonia and vinager in the bottle when doing the bottle spell? 2) How many times the person' name can be writing? 3) Can I write my curse on the person' name ( before I put it inside the bottle)? No, I would not put both ammonia and vinegar in the same jar, these are 2 different spells. Yes, you can write your curse over the person's name and you would do it 9 times. Thanks very much for the information. I will try it. When I did the first Vinegar spell jar, I also put ammonia and all other things recommended in the forum. Now I found out that by adding the ammonia I was wrong. Can I throw out that mix- liquid in the jar and then put just the vinegar? or Do I have to begin all over again? Unfortunately, I would start again if this were me. I thank you very much for your advice...re-start is not a problem; which I will begin immediately. I know revenge is a Sin. Sometimes it is the only way to obtain a justify justice. I have a question in wring the petition ....should the petition be writing on top of each name (9)times or criss-cross beginin from the end of the person' name?.. I need to do a work that it will give me results (DUME). Can a Reversible candle be placed on a vinegar jar spell? Can a Reversible candle be placed on a vinegar jar spell? I is good idea to burn all that mess to get rid of it? Yes you can use this spell to cleanse and open the ways. A cap of ammonia with a cup of sea salt as a spiritual bath can also help cleanse it off of you, I would also cleanse your home with chinse floor wash ( ammonia works too) all the while praying to be cleansed from this spell. It is a weird spell that a person wish to banish and bind you, banish is to send you away bind is to hold you? So the person must have been confused on what they were doing.. Did you destroy the container spell? if so that is a good thing, if not go back and get it. Fiery wall of protection is another great product used to protect people from work. I just received a call g om my sister and she said that she's really struggling. Im thinking of doing a couple of these jars but my petitions are what's confusing me. This seems like a really fun spell. I will definitely use this when I go to vegas along with the other money supplies to back it up. For the petitions just write what you want. ex: Sister is wealthy and financially stable. It really is that simple. If you really want to get to know petition papers I recommend getting Miss Cat's book A Paper In My Shoe (http://www.luckymojo.com/paperinmyshoe.html). It will give you all you ever needed to know on petition papers. Oh I thought to write the current situation???? I just didnt know if I was being to vague for the situation. I just turned my current situation upside down in the ammonia jar. The first one leaked I took it as my petition wasnt worded correctly so I redid it and no leaking. I would just personally prefer one jar per petition. I've been on lucky mojo for a while and this spell interests me. How would I write the petition to get my ex back? While doing a honey jar of course. Would I put something along the lines of "being broken up with _______"?